There Aren't Any Snow Guard Police: What's On Your Metal Roof? This is part one of a two-part series on qualifying snow retention systems. There is a new (and much needed) document recently published by the Metal Construction Association (MCA): Qualifying Snow Retention Systems for Metal Roofing. This new industry consensus document is perhaps the most valuable tool in your toolbox if you are involved with any aspect of snow guards for any metal roof application. In places where it frequently snows a lot and even in places where it doesn’t, metal is a favored material in protecting a house or other structure. On the surface, snow might appear to be rather innocuous, as it gently falls from the sky like the ending scene in the movie, White Christmas. But what the movie doesn’t show, is all through the night and much of the morning (if not longer) the light fluffy stuff piles deeper and deeper on top of the roof, incrementally increasing its own weight. Then, when the sun comes out, an avalanche of snow tumbles down onto unsuspecting persons, vehicles and landscapes below. The forces involved when such an event takes place can be scientifically calculated and should be scientifically resisted with proper snow guard design, testing and engineering. Although this field is highly scientific and potentially life-threatening, the truth is, anyone and their dog can manufacture snow guards, market it with any fancy language they desire and sell it to the unsuspecting public. There are no “snow guard police” watching. No code or industry standard that governs this practice. No building inspectors that check snow guards for structural adequacy. This approach to a pretty serious business means that building/home owners are left out in the cold, (hopefully without a huge chunk of snow careening toward them); and it means architects and installers of such systems can potentially be sued for both personal and property damage from faulty snow retention systems they specify or install. But a document does now exist that lets you sift through the technical lingo and make smarter decisions. Qualifying Snow Retention Systems for Metal Roofing is the only industry consensus document currently available to guide consumers, architects, specifiers and installers in choosing and implementing a properly engineered, accurately-tested-for-intended-load, long-lasting, dependable system. Keep in mind, however that conformity with this document is not mandated by any building code. So, buyer beware. YOU are the snow guard police! But now at least you have a “rule book” to follow. Residing in northern climates means being closer to extreme weather elements. Snow, ice, thermal movement, freezing temperatures, U.V. exposure and stress can all take a toll on your roofing material. This “thermal cycling” of the roof, constantly causes movement and stress. Snow and ice yank and pull on the roof’s surface, potentially to the point of tearing it apart. Thermal movement develops due to the range of temperatures the roof experiences. Every time the material heats up or cools down, it expands or contracts. Freezing temperatures have their own special method of destruction. Sudden drops in temperatures turn snow and melt water to ice, pry flashings from the roof, inhibit proper drainage, rip gutters from eaves, and have the potential to cause serious damage to anything below. A special kind of climate demands a special kind of roof. When considering extreme ultraviolet exposure, some might automatically think of locations such as South Florida. But higher elevations can easily experience even more intense exposure. To combat these harsh conditions, metal has become a product of choice for roofing in cold climates. Its durability is unmatched when dealing with snow, ice and thermal cycling. But knowing you need a system and knowing how to choose a system are two different things. From companies who publish specific technical data and how they got it by appropriate test methods, to companies listing unsubstantiated data - to companies listing nothing at all - it can be difficult to qualify snow retention systems. Regardless of whether you are a homeowner, architect or installer, you all share a common desire: The system must work when it needs to. Simply put, all snow guard systems “represent a load chain to transfer the sliding forces of snow into the building structure.” A proper design will be able to withstand the forces absorbed at each point in the chain. Through a combination of mathematical calculations, science, and testing of each point of the chain, a proper design is engineered. One-time service is typically never adequate. 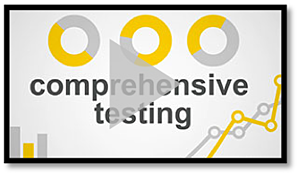 Reliable and dependable results should be continuously achieved through quality assurance: repetitive testing, production, manufacturing, specific project design, installation and track record of real installations. What Defines Durability and Reliability in a Snow Guard System? 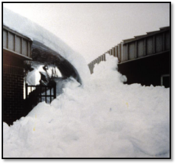 To understand exactly how snow retention works, it is important to start with the intended purpose of the system: A snow guard immobilizes the snow on the roof at its densest point. 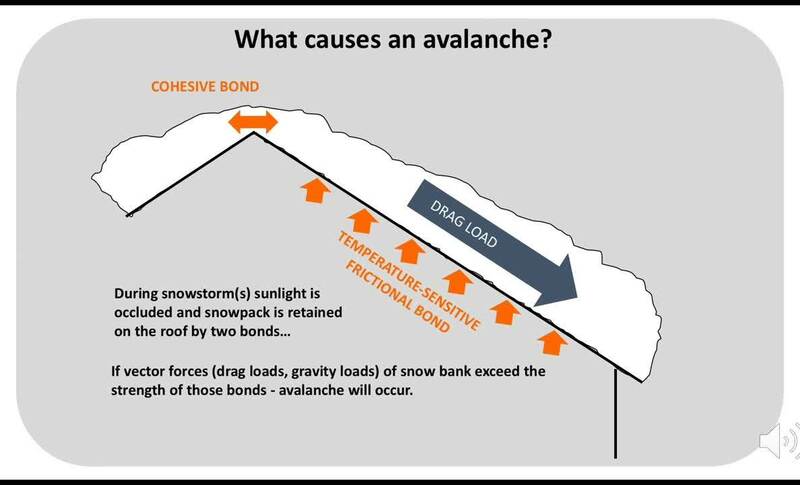 It increases friction between the roof and snow, retaining snow pack on the roof, so that it evacuates in a predictable and controlled fashion (through thaw and evaporation) rather than by a sudden and dangerous rooftop avalanche. Snow guards rely on the compressive strength of the mass of snow to restrain its movement. 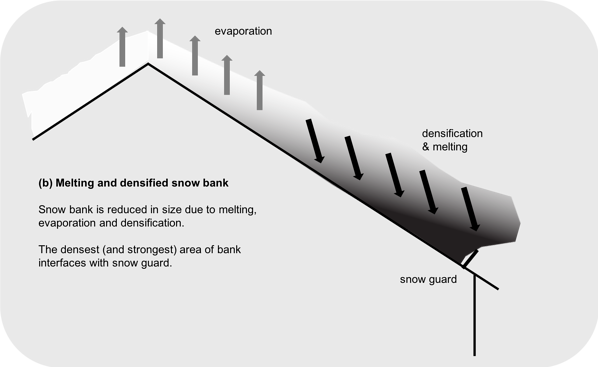 Gravitational forces compress the snow bank immediately adjacent to the roof surface and especially toward its lower end, increasing its density, and compressive strength. (See Figure 6 and Figure 7: The deeper the color, the greater the compressive strength). A properly engineered roof without any snow retention system is already required to withstand a specific snow load as determined by local building code. This means your roof won’t cave in when snow piles up on it. Tributary snow loads are the accumulation of loads over a specific area directed to a specific structural element. 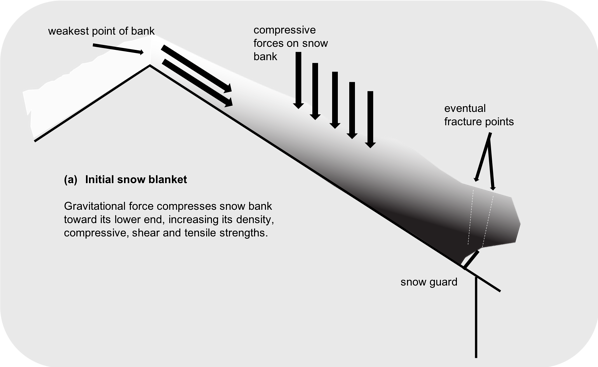 The vector force, (also known as drag load, gravity load, and sliding force of snow), is “the force acting parallel to a sloping roof surface that results from gravity loads of snow on that sloping surface.” The snowpack creates a calculable force over a specific area for which the snow guards can be designed to restrain. And it is the snow retention design that will then assist in spreading these loads across the roof panels and holding snowpack in place until it slowly evacuates the roof by thaw and evaporation. That is why choosing the right engineered and tested snow guard system for (and ensuring it is installed correctly) on your roof is so critical. Roof pitch, ridge-to-eave distance, design, roof snow load, standing seam spacing, and appropriate strength of each link in the load chain are all used together to determine the force of snow on the snow guard system and how many guards should be installed to resist it. It is not voodoo—it is proven science! S-5!® takes product and design seriously with online tools to follow MCA’s guidelines with every single one of our snow retention systems. Learn more about the snow retention solutions we offer. For additional trusted and technical information and advice, check out MCA’s (Metal Construction Association) vast library of free downloadable documents. Click here for Part 2 in our series on qualifying snow retention systems. Learn more about the components of a snow guard system. Share your S-5! attachment solutions success story snow guards.